Define what’s causing your fight with food first. Use facts from credible sources to decide what needs to be done to solve the problem. The first step – to spot the problem – is indeed a sensible way to go but unfortunately nowadays many are mistaken in what they perceive to be the issue. . When it comes to spotting the problem, countless individuals are labelling gluten as the culprit. Now for some, gluten may indeed be causing digestive woes along with a host of other ills. For the 1% of the population who have celiac disease, gluten can cause a whole range of problems-both short term and in the long run. For those with this autoimmune disease, eating gluten doesn’t just lead to just tummy troubles. There can be serious health problems from head to toe. From what some call brain fog-and inability to think straight -to skin problems, digestive difficulties, malnutrition due to poor nutrient absorption, bone thinning and more. For these individuals, eating gluten can certainly take its toll. Then there are those-about 5% of the population-who have non-celiac gluten sensitivity. They also suffer with various symptoms, not just gastrointestinal ones. Being gluten-free has become very trendy as celebs tout the diet as a weight loss strategy. It’s not the gluten, though, that’s responsible for shedding weight. It was more just how limited the dietary regime was. But these days, the gluten-free market has exploded and there’s as much gluten-free junk food as there is regular. For those who suspect gluten as a dietary offender in their digestive distress, while cutting out gluten and diagnosing the problem yourself might seem like a smart idea, it is anything but. It’s, in fact, the last thing you should do if you suspect that gluten is making you sick. Even minute amounts that might be found on food due to cross- contamination such a dish being prepared in a pan where a food containing gluten was cooked previously, can cause problems for someone with celiac disease. In fact, these tiny amounts of gluten overtime for an individual with celiac disease can actually boost the risk for certain cancers. This is why a person who suspects gluten is making them unwell should not cut it out before being tested for celiac disease. The initial testing involves measuring certain antibodies produced when someone with celiac disease eats gluten. So if a person cuts out gluten and then goes for a test, they will not produce the antibodies and subsequently will get a false negative test result. Having a biopsy to make the diagnosis is also necessary but again, without gluten being eaten, the biopsy would be negative because there would be no damage observed due to the effect of gluten. Now you may wonder why this is such a big deal. I can’t tell you the number of people that have told me they just cut out gluten and felt so much better so they didn’t need testing. But the same people when they don’t have a definitive diagnosis are less likely to be as vigilant about gluten as they should be. Simply put, if you have symptoms, are gluten-free and feel better, will you read every single label of each and every food you eat? Will you be very strict everywhere you go? I see clients who have gone gluten-free but in extreme circumstances, such as being starving and having no other food around, will stray from the gluten-free diet. Or maybe they’re tempted by a favourite food which is suddenly presented. Or what about going to dinner at a friends and you forgot to inform them? But if they have a diagnosis, then they tend to be vigilant 100% of the time. And that’s what the treatment is for celiac disease. That’s it – a gluten-free diet. For those who have non-celiac gluten intolerance, minute amounts might be fine and have no long-term consequences. All too frequently, I hear people say that they’ll just try a gluten-free diet and see how they feel. But if they feel better, going back to gluten to get a definitive diagnosis can be absolutely dreadful. After having been on a gluten-free diet, in order to get reliable test results, it involves eating gluten again, possibly plenty of it for a somewhat extended time. For someone who feels better after eliminating gluten, eating enough gluten for accurate testing can be a daunting task and one that many people simply can’t follow through on. So before you cut gluten out, take step number 2 and get the facts from credible sources to decide what needs to be done to solve the problem. 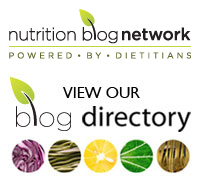 ← Dietitians of Canada Nutrition Month: Take the fight out of food! Thanks for this article. Have you ever come across a person who has the marker for celiac disease in their blood, but who has no symptoms of the disease? My husband was put on a GF diet solely because of this blood test, and anemia which wasn’t caused by diet. After five months of following a GF diet, with no change in anything, except the haemoglobin level continues to decline, we’ve taken him off the GF diet, and the Doctor has started iron supplements and he’s had a bone marrow biopsy yesterday. His colour has improved over the past week with the supplement.I felt all along the anemia was not caused by celiac, what are your thoughts on this? P.S. I am a retired dietitian. Vicky, please let me confirm. Was he placed on a gluten free diet without having a biopsy done? The biopsy (which includes a number of different sites in the bowel) needs to be done to confirm the diagnosis of celiac disease. A gluten-free diet shouldn’t be instituted until this has been completed as the blood tests alone are not sufficient to make a diagnosis. In some cases, abnormal blood tests can be the sign of other autoimmune issues. As for symptoms of the disease, while there may be no obvious ones, conditions such as anemia or other signs of nutrient malabsorption can indeed be the only clue/ symptoms of ceiiac disease. So while the supplements may improve the anemia, you might want to follow up on the blood tests and possibly repeat everything once he has been eating gluten for long enough. Well, there was villi in the small intestine which showed some atrophy, a small amount of villi, not significant, I think, never causing any trouble. But, we did see an Internist last week, she did the bone marrow biopsy yesterday, and thought he could come off the GFDiet for now. He’s never had any symptoms of any digestive problems, just the slow decline in Hb and , I think, ferritin numbers. It is confusing, but maybe with further investigation, we will find out what’s happening. Thanks for your comments. Vicky, not everyone with celiac disease has gastrointestinal symptoms. I might suggest you get more information about the biopsy as it might not have been done in the best way. This talk (http://www.medscape.com/viewarticle/755402) by Dr. David Johnson, Professor of Medicine and Chief of Gastroenterology at the Eastern Virginia Medical School in Norfolk, Virginia explains the problems about how the biopsies fall short and often miss the diagnosis of the disease. He states, “We also know that endoscopists do not do a great a job of making this diagnosis of celiac disease, possibly because they most frequently and most commonly miss the mark by their biopsy technique.” He also states, ” biopsies should be taken from the proximal small intestine and should range from 4 to 6 in number.” The article is quite enlightening about the incidence of a missed diagnosis and offers detailed information about what should be done. I might suggest discussing it with your husband’s physician. Best of luck! Thanks for your help. We will continue to investigate. Great article. I am so glad that people are talking about this. I have Celiac Disease…was diagnosed with a biopsy over 20 years ago. It’s now very hard to go to a restaurant and ask for a gluten free meal without having people ask if it is a lifestyle change or are you REALLY allergic?? I will be glad when people that think it is a way to lose weight get off the “Gluten Free Band Wagon”. Yes, sure there are more food choices because of the focus on gluten, but I find it’s much more difficult to have people take you seriously about what will be the outcome if you do actually get contaminated food. Barb, I agree with you wholeheartedly. It is indeed unfortunate that many people who do not require gluten-free foods ask for it in restaurants. Some will then eat other gluten-containing foods there leading the wait staff to minimize the importance of all gluten-free requests.